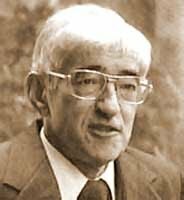 John Dominic Crossan is a well known New Testament scholar. He is no stranger to controversy and has caused quite a few groans and tempers to surface among his colleagues. But whether you agree of disagree with him, he has helped to generate a lot of discussion in relation to the New Testament. I ran across an article in the LA Times today in which they summarize Crossan's view on the Lord's Prayer. He has a new book coming out in which he examines the well-known prayer. Here is an excerpt from the article. Crossan calls the Lord's Prayer "a prayer from the heart of Judaism on the lips of Christianity for the conscience of the world." To understand it, he said, it is necessary to comprehend the culture in which it was written, that of 1st century Judaism. The prayer appears in the New Testament twice, in slightly different forms: In Matthew 6:9-13, and in Luke, 11:2-4. In both cases, it is delivered by Jesus, which helps explain the revered status it holds. When Jesus' disciples heard the prayer, Crossan said, they would have responded differently than a modern churchgoer. To begin with, he said, the term "Father" — "Abba" in the original Greek or Aramaic — connoted a "householder," one who oversaw the affairs of a family. A householder, he added, would have been judged by how well he provided for everyone. When the prayer continues with "hallowed be thy name," he said, what it means by "hallowed" is "a fair distribution for all, the justice of an equitable household." In other words, Crossan said, the prayer is about "distributive justice," about making sure that all are cared for. "It is revolutionary," he writes, "because it presumes and proclaims the radical vision of justice that is the core of Israel's biblical tradition.… It dreams of an Earth where the Holy One of justice and righteousness actually gets to establish — as we might say — the annual budget for the global economy." You can read the full story here. Again, whether you agree or disagree he certainly gives us reason to talk. Nijay Gupta has alerted me to the passing of Dr. Traina. He is probably best known for his book Methodical Bible Study. Traina first published the book in 1952 and it is still being used in seminaries across America. 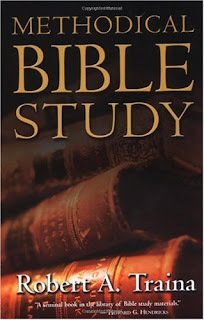 I used it when I was in seminary and it is the basis for the Foundations of Bible Study class I teach here at Ashland. Here is Dr. Traina's Obituary. TRAINA Dr. Robert A, 89, widower of Jane Odell Traina, died Tue, Nov 9, 2010 at his residence in Wilmore, KY. Born in Chicago, IL he was the son of the late Angelo and Argia Giovanonni Traina. He was a professor of biblical studies at Asbury Theological Seminary and member of the New York Conference of The United Methodist Church. He received the following degrees: AA from Spring Arbor University; BA from Seattle Pacific University; STB and STM from Biblical Seminary; and PhD from Drew University. Survivors include a son, Bob E. (Glenna) Traina; two daughters, Jan (Len) Wofford, Judy (Marty) Seitz; seven grandchildren; five great grandchildren; three sisters, Norma Mayhle, Rose Anderson and Vi (Dave) Corey; and two brothers, Don Traina and Ed (LaVerne) Traina. A graveside service will be held 10:30am Sat at Blue Grass Memorial Gardens by Dr. David Bauer. Burial will follow for family only. Visitation will be 6-9pm Fri at Kerr Brothers Funeral Home, Harrodsburg Rd. A celebration of life will be held at 3:30pm Sat at Estes Chapel at Asbury Theological Seminary. Jesus is turning over the tables at SBL! Well, everyone else is posting this so I thought I might as well join in. 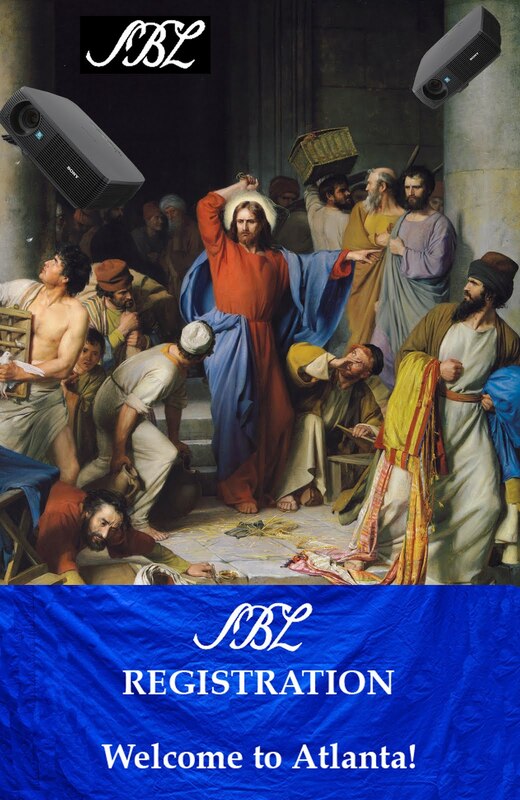 It seems that the powers-that-be in the SBL have decided to charge a $25-$75 fee to those participants who use projectors as part of their presentation. This of course is on top of the registration fee and the exorbitant prices we pay for hotels and food while we are at the conference. Well a number of bloggers are up in arms over this, but the most articulate answer has been posted by Bob Cargill. In addition to his witty and incisive post he also has some interesting illustrations he made to help make his point. Please note exhibit A.
Ladies, are you sure you want to go to seminary? Thanks to Heidi, one of my students here at Ashland, for this cartoon. I think this one is even more funny than the one on "Are you sure you want to do a PhD"? The problem with both of these cartoons is that they are so true to life that you aren't sure whether you should laugh or cry. Ladies, I hope this is NOT your experience. "The Man who hates and divorces his wife," says the LORD, the God of Israel, "does violence to the one he should protect," says the LORD almighty. 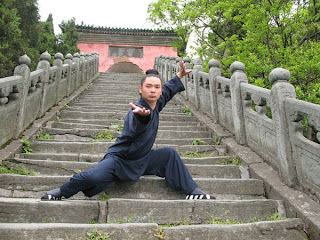 "So, be on your guard and do not be unfaithful." "I hate divorce," says the LORD, the God of Israel "and I hate it when people clothe themselves with injustice," says the LORD Almighty. In the Hebrew, God's declaration in the first half of this verse is very elliptical and hard to translate. An interlinear reading might yield, "Hating," "divorcing," "and covers," "violence," "upon protection of him"! But how do you put all those concepts together? The first word is a masculine participle, followed by an infinitive construct, suggesting "the man who hates and divorces." "His protection" could refer to clothing, but a more contextually meaningful translation would refer to the one he was supposed to protect, namely, his wife. Most scholars now think that the first half of the verse means something like "the man who hates and divorces" (the ESV follows this interpretation). The more minor changes in the final part of the verse simply use more current English. After reading the Hebrew for myself I find their argument more than convincing. I see little support for making God the one who hates divorce in this verse. Moreover, in the context of the chapter the statements in Malachi 2:13-16 are directed at the husband and the way that he treats his wife. So does this mean that God approves divorce and no longer has a distaste for it? Hardly. There are more than enough passages in the Bible which communicate the complete opposite. But still this new translation of Malachi 2:16 does help to open up the passage to us. Rather than focusing simply on divorce, God has some very strong things to say about husbands who mistreat their wives, are violent with them and divorce them. What we see, then, is that if God hates anything in the context of marriage it is when someone mistreats their spouse. 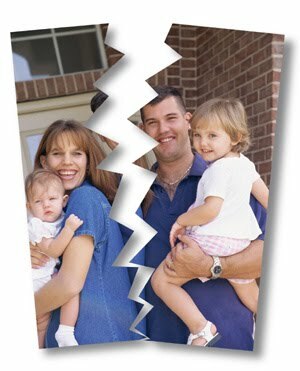 Divorce is not the only way of being unfaithful to the one whom you married. What music do you listen to while you study? The Koinonia blog asked this question today. I admit that sometimes I will listen to music while I study. 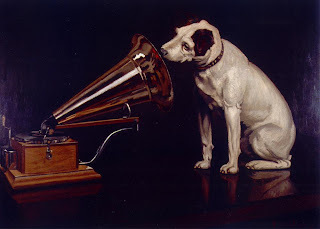 I can't listen to anything if I am doing new research or writing. I need to concentrate and the music becomes a distraction. But if it is music that I know very well and there is no singing I can get away with it. This works well for when I am editing or doing mindless stuff like bibliographic work. Quite often I will listen to Pandora. I have a number of stations including Jim Birckman, Enya and other quieter type music. But I also like to listen to Pink Floyd when I am translating. I have a CD that my brother-in-law made me. It is a compilation of only the extended instrumental sections of some classic Floyd songs. It lasts about two hours and is great for doing translation work. If my Judith translation in the CEB reads a bit odd at times you can blame it on Roger Waters and David Gilmour. I also think it is what forced one of my colleagues to move his office away from mine. What about you? Can you listen to music while you study and if so who/what is your preferred artist or genre? Michael Bird and Nijay Gupta have announced the launch of a new journal that focuses on Pauline studies. It is being published by Eisenbrauns and edited by Bird and Gupta. Here is the description. The Apostle Paul stands as an incredibly important figure within the religious and intellectual history of Christianity and Judaism in the first century. The study of Paul (the historical person, author, tradition, and legend) and the Pauline letters (content, context, authenticity, theology, and reception) continue to capture the fascination of scholars, students, religious communities, and even the media. A number of journals geared toward New Testament studies in general often contain a disproportionate number of articles dedicated to the study of the Pauline corpus. There is a never-ending avalanche of Ph.D. theses written about Paul and about the countless approaches and methods used to analyze the Pauline materials. Indeed, the study of Paul and the Pauline letters appears to be an almost inexhaustible field of investigation. Therefore, we think it time that Pauline research should have its own dedicated journal as a specific conduit for Pauline research as it is broadly practiced. In light of these considerations, it is my pleasure to present to you the Journal for the Study of Paul and His Letters (JSPL). The JSPL will present cutting-edge research for scholars, teachers, postgraduate students, and advanced undergraduates related specifically to study of the Apostle Paul and cognate areas. It is proposed that the many and diverse aspects of Pauline studies be represented and promoted by the journal. The purpose of the journal is to advance discussion on these areas of Pauline research. As such we invite submissions on the above mentioned topics that make a significant and original contribution to the field of Pauline studies. The inaugural issue of JSPL includes a contribution by one of its editorial board members, Dr. Susan Eastman of Duke Divinity School (USA) on “Philippians 2:6–11: Incarnation as Mimetic Participation.” Delving into the Christ-Hymn, Eastman argues for a close link between imitation and participation in Paul’s explication of his gospel to the Philippian audience. The first regular issue of JSPL will include studies such as Paul Foster, “Eschatology in the Thessalonian Correspondence”; Michael Gorman, “Justification and Justice”; Richard Bell, “Paul’s Theology of Mind”; and a review of Douglas A. Campbell’s The Deliverance of God by Christopher Tilling and Michael Gorman, with a further response from Douglas Campbell. Here are a few things that you might find of interest today. Mark Goodacre has posted a video of NT Wright talking about Mary Magdalene and Apostle Junia two important women from the New Testament. Here it is. Michael Bird, Tom Shreiner, and Craig Blomberg each give their two cents worth in the pistis christou debate. Creation Untamed V: God, Faith and the Practice of Prayer. This is the last installment on Fretheim's book Creation Untamed. In the final chapter he looks at how faith and the practice of prayer are related to suffering. In the context of natural disasters it is not uncommon to hear prayers offered to God. In the wake of an earthquake we might hear someone ask God to help them. Or adversely they may ask why God did not help them. Sometimes people pray that God would send rain to break a long drought. Other times we might hear of or see people who pray that God turn a storm from the path it is taking in order to protect their community. The question is , of course, does God hear any of these prayers. And if so, where are the answers? Fretheim considers such questions by first offering a definition of prayer. He understands prayer as communication between believers and their God in a relationship of consequences (p. 124). And how one thinks about prayer and practices prayer depends a great deal on how one views God (p. 129). On the one hand, we might see God as an uninvolved, even uninterested, observer. On the other, we might see God as a super hero with whom there are no restraints. Anything can be accomplished. But Fretheim suggests that such visions of God skew the biblical presentation of God in regards to prayer (p. 131). Fretheim insists that we must understand that God interacts relationally and that God has established a genuine relationship with creation. This means that in the case of prayer humans have a say. God wants to and does hear from us (p.133). But such a posture on the part of God involves some risk. "By giving us speaking privileges, God makes God's self vulnerable" (p. 133). "Prayer is a form of power given to us by God." Though God does not give up the situation, God shares power with us and we can then act in concert with God rather than in competition with God (134). This leads to what we expect from prayer. Is it answers or response? Quite often are prayers are such that they only solicit an answer from God and God's answer is either yes or no. But in the Bible the model we have is response. Quite often the Psalmist will urge God do something. This introduces an open-endness to the situation. God takes human concerns into consideration and provides a response, not just an answer. And numerous are the reasons that our prayers are not responded to in the way we might like. It might be hindered by our own sin or that of others. The realties of life and the randomness of creation might hinder God's response to us (p. 145). We may think that all that is at work in a given situation is God and our prayers. But there may also be a multitude of factors that resist God's will. And, Fretheim says, "Gods heart is the first heart to break; God's tears are the first to flow" (p. 145). Prayer then is not a way to garuntee an answer, response or cure. It is a God-given way for us to make a situation more open for God, to give God more room to work. Prayers effect the outcome of the future, Fretheim argues. But so also do the actions of humans. And therefore the shape of the future depends as much on us as it does God (p. 147). As I was digesting this final chapter I was trying to think of examples of how prayers to God, in the case of a natural disaster were/are hindered by humans. The situation in Haiti came to mind. The earthquake that devastated Haiti happened 10 months ago. Yet, almost none of the monies promised from donor nations has reached that tiny country. Most people are still living in make-shaft refugee camps. This should be particularly embarrassing for the USA since Haiti is in our backyard and we have a long history of interaction/interference with that country. Last week Haiti was hit by flooding as hurricane Tomas passed by. The results? More death and more disease. This seems to be a good example of what Fretheim is talking about. I am sure many people in Haiti prayed that Tomas would not come there way. And yet it did and worsened the tragedy. But can we blame God for this situation when our actions (or lack there of) have done nothing to reduce the suffering there? 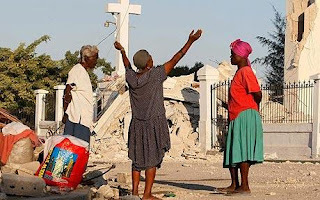 Perhaps we have been a hindrance to God and the prayers of people in Haiti? No, this is not the title of the next Crouching Tiger Hidden Dragon sequel. It is two items in this weeks news. The first is about a Bible that was apparently hidden in the wall of a Texas Courthouse around the time of the Civil War. The Bible just happens to be a 1615 KJV. Here is the article. A walled-up closet in a building where a new museum is planned in San Antonio has yielded historic items including Civil War photos and a 1615 King James Bible.About 200 items were discovered in late October during renovation of the former Hertzberg Circus Museum. The $30 million Dolph and Janey Briscoe Western Art Museum is expected to open in late 2011.The building also formerly was the city's 1930 Carnegie Library.San Antonio Public Library spokeswoman Beth Graham says the Bible appears to have been printed in London. Graham calls it an unexpected "time capsule." You can read the more about the discovery here. The next story is how China has now printed its 80 millionth Bible. Apparently one in four Bibles is printed in China. Here is an excerpt from that article. One in four Bibles in the world are printed in China, and Monday, the only authorized Bible-printing company in the country printed its 80 millionth holy book, amid government officials' and overseas church leaders' blessings. The number means China has become one of the biggest Bible publishers in the world, said Qiu Zhonghui, chairman of the board of Amity Printing Co. Ltd. Based in the eastern Chinese city of Nanjing, Amity Printing is a joint venture between China's Amity Foundation and the United Bible Societies. 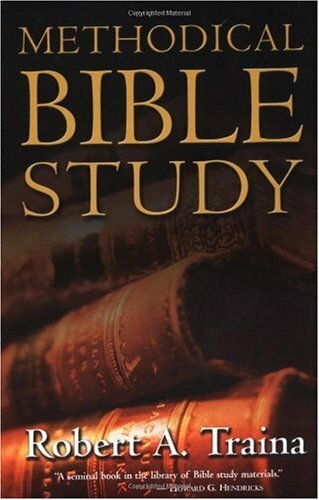 The company has only published the Bible since its founding in 1988 and it now produces 1 million copies per month. "The production of 80 million Bible copies can be attributed to the work of China's Christians, and, more importantly, the country's reform and opening-up policy," Qiu said in a celebration ceremony in Nanjing. Apparently the Chinese are taking a page from the American approach to Christianity. It's better to profit from it than control it. Read more here. We live in a society that has become more informed about and compassionate towards those with disabilities. It is becoming more common for stories about people who experience physical and mental challenges to become a more visible part of our society. The Americans with Disabilities Act of 1990 enshrined in law what needed to become a national attitude towards those who are disabled. To be sure, the Bible does not always speak of disabilities in a disagreeable manner. Jacob, after all, has a limp from God (Gen 32:31) and Mephibosheth is no longer able to walk after being dropped as a child (2 Sam 4:4). Indeed, the Bible has sharp words for those who abuse the disabled (Lev 19:14). But the witness of the Bible is uneven on this topic. While we are encouraged not to abuse these people, we are also told that they are to be excluded from certain activities and even from acts of worship. Most of what I have quoted, of course, comes from the Hebrew Bible. But the New Testament provides numerous examples. 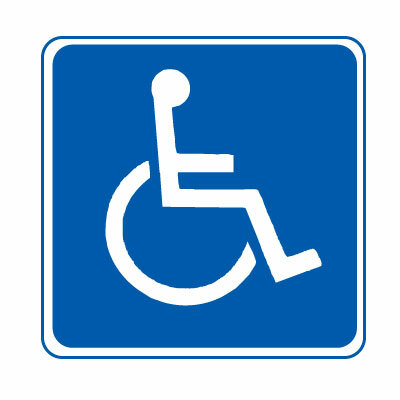 In Mark, for instance, Jesus heals a man with a withered hand in the synagogue (3:1-6) which seems to indicate that while the disabled may not have been allowed to worship in the temple they could participate in synagogue. But there is dark side even in the New Testament. In John 9:2 we read that the disciples connect a congenital impairment, blind at birth, with sin (John 9:2). And in Mark 9:14-29 a boy with the symptoms of epilepsy is said to have a demon. The author of Matthew seems to have recognized that what afflicted the young boy was more neurological than spiritual as reflected in the way he adjusts Mark's version of the story by stripping away most of the language of demons and instead introducing the boy as suffering from some type of mental illness (Matt 17:15). All of this should lead us to reconsider the way that we read the Bible in light of our modern understanding of the challenges and disabilities that hinder our fellow human beings. In a recent blog post Paul Franklyn, associate publisher for the CEB, commented on how the translators grappled with translating terms such as "cripple" and "lame" for an audience that may not find these terms an acceptable way to talk about others. Also this week, Jeremy Schipper, in the SBL Forum, talks about disabilities in the Hebrew Bible and points out that often the statements about and instructions concerning various disabilities do not approach the topic as a medical issue, but a religious one. He cautions us that when the Bible talks about a disability that it may not be talking about disabled people, but some other topic. So where does this leave us? With yet another thing to be aware of when reading the Bible. Just as we have reevaluated the way the Bible talks about and portrays women, the foreigner and slaves, we need also to beware that some passages in the Bible prove to be more difficult to preach than others, especially to a group of disabled. Just as it is hard for us to identify with some of the time and culturally bound passages of the Bible, it can be difficult for some to hear about those in the Bible who faced challenges similar to their own and were excluded because of them. This means that when preaching on passages like Leviticus 19, 21 or even John 9 we need to exercise caution so that we do not allow statements in the text to marginalize those in the audience who might be blind, handicapped, or suffering from mental illness. It means that biblical studies is hard work.